Ok... Now you've breeze through the past 3 parts and got yourself mentally prepared. And you want to get started? Alright. Let's waste no time. Ah yea. Just before I forget wallet. There's many wallets available in the market. You may wish to google more about it. I feel that the safest still, is still Hardware Wallet like Trezor and Ledger which cost $200 and $110 respectively. There's also software wallet available like Jaxx, Exodus etc. whereby you can download the application onto your desktop and smartphone and that's where you store you coins! What's a Fiat-Crypto exchange? It's just like any brokerage houses out there, which serves as an exchange for you to change your cash into stocks. In this case, you're cashing in not for stocks, but for cryptos. Personally, I'm using Gemini and among the other contenders they're currently offering the lowest charges. However, deposits are only allowed in USD. This also means that you'll have another step in between, which is to remit USD to your Gemini account, which personally I'm using DBS for the remittance. It's also really fast, taking less than a day for the sum to be reflected in your Gemini account. Gemini allow you trade with USD/BTC, USD/ETH, ETH/BTC, BTC/ETH, ETC/USD, BTC/USD. Here's a simple guide for you if you're planning to use Gemini and have no idea on how the remittance can be done! Do check your email as Gemini will be sending you an email on the account to transfer to and the reference number to key in for your remittance. 2. 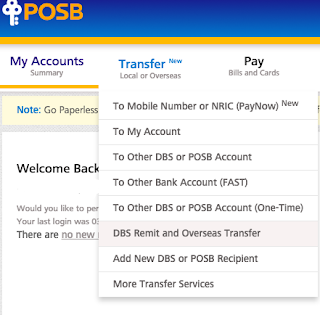 Login to your DBS/POSB iBanking. 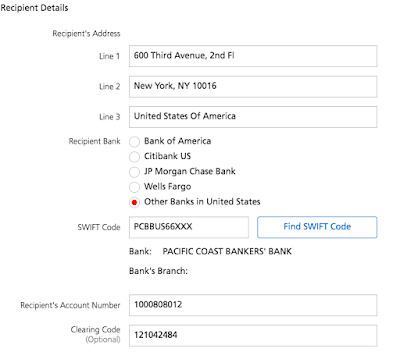 Hover your cursor around "Transfer" and select "DBS Remit and Overseas Transfer"
3. Key in the details as follow. *Do remember to add in the unique code given by Gemini during your transfer under "Reference"
Please revert to the email sent by Gemini. Here's a snapshot of the email sent to me earlier from Gemini when I'm doing the deposit. I've omitted the my code out to avoid confusion. 4. Wait! Give them some time. Once it's ready, Gemini will send you an email to inform you when your funds are ready! If you've deposited in the morning or early afternoon, you should be receiving your funds in your Gemini account by 9 or 10pm when the US bank opens. Here you go. There you'd be able to find yourself with some BTC and ETH to kickstart your journey!! It's best to start with ETH/BTC to 'feel' how it is like in the crypto world before venturing into some alternative coins! Once you're ready to venture into the alternate coins like ETC, Ripple, Monero, Dash, IOTA, NEMS etc. Similarly, there's a wide range of exchanges that offers such services like Bitfinex, Bittrex, Shapeshift. It works by sending your ETH/BTC to their wallet. Next, provide your alternate coin wallet address and once it's ready, they'll deposit it into your alternate coin wallet. Coincap.io, CryptoCompare for the list of crypto, volume, price movements, market cap. Blockfolio on App Store. I personally find the portfolio function pretty useful. As the week is ending, I will soon write about my experience as a crypto trader for the past week. The journey thus far has been rather interesting, rewarding and I've learn pretty much stuffs, that I would have never learnt as an investor. So which hero did I choose? P.S: I've an affiliate link for Changelly. reading your crypto blog with great interest. still learning before i give it a test run. pardon me if i ask stupid qn. if gemini allows you to trade: USD/BTC, USD/ETH, ETH/BTC, BTC/ETH, ETC/USD, BTC/USD..
why do you still need changelly? what is this for? Thank you for dropping by my blog! I'm glad that my post interest you. Gemini only allows you to trade between USD, Bitcoin (BTC) and Ethereum (ETH). To be investing/trading other alt coins like ETC (Ethereum Classic), Litecoin (LTC), Ripple (XRP), ZCash (ZEC), DigitalCash (DASH), TenX (PAY) and more, you will need another crypto-crypto exchange. 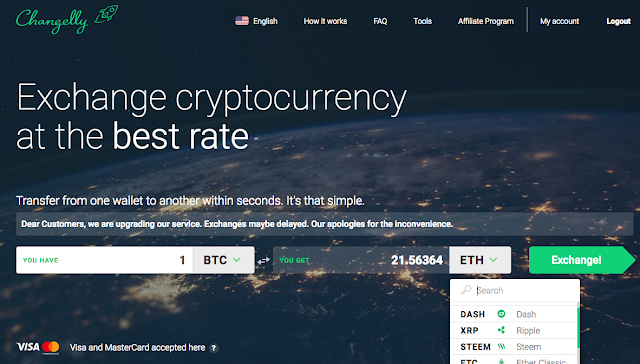 In this case, Changelly serves as a crypto-crypto exchange for you to change your BTC or ETH into the alt coins. I'm more than glad to answer any questions of my knowledge! :) You may wish to email me if you have further questions! "All customers receive 30 free withdrawals per calendar month. Additional withdrawals will result in fees equal to our estimated mining fees of 100,000 satoshi (0.001 BTC) per transaction on the Bitcoin Network and 0 GWei (0 ETH) per transaction on the Ethereum Network." The above mentioned is only for "deposits/withdrawal" of BTC/ETH and not for fiat currency. 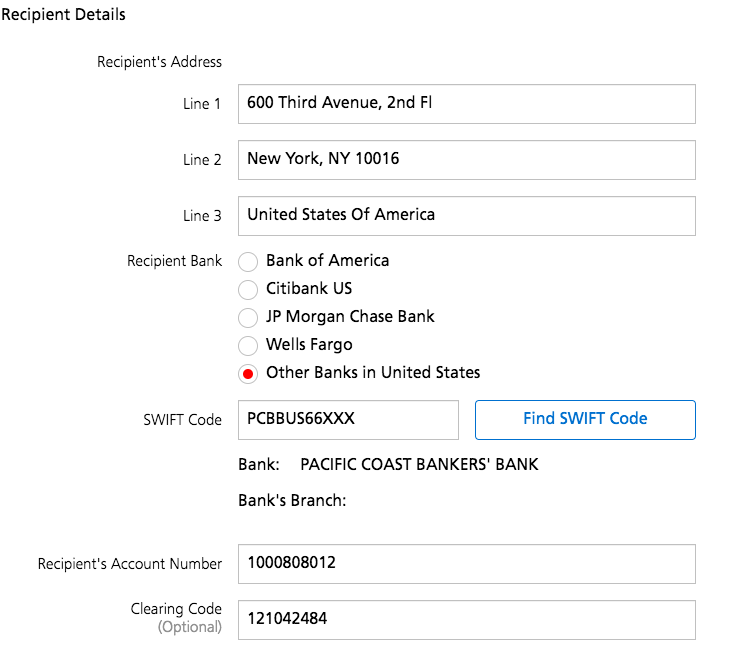 When sending/receiving BTC/ETH it is classified as deposits/withdrawal. On a side note, I happen to see that the wire transfers for both deposit and withdrawal to be free! I've chanced upon a post previously on the withdrawal of fiat from Gemini, and perhaps you could take a look at it. Unfortunately, I have not made any withdrawal yet and I'm unable to verify on the fees that Gemini is charging as mentioned in the post. Perhaps soon, I could write a little more about the withdrawal fees after verifying. As this is a "heavy" fee. yea, i saw that too. abit conflicting ..
btw, are you using hard wallet? ie ledger nano? Yea, it's a little conflicting there. But well.. I shall take a look into this issue real soon. As I'm currently situated in Japan, and Japan being a country that actually REGULATES Bitcoin, I've been trying to look for it in the big electronics store but unfortunately, I did not manage to find it. I'm planning to order online for it. When that happens, I will have a wallet to "buy-and-forget-and-comes-back-6-years-later-with-a-quarter-million". 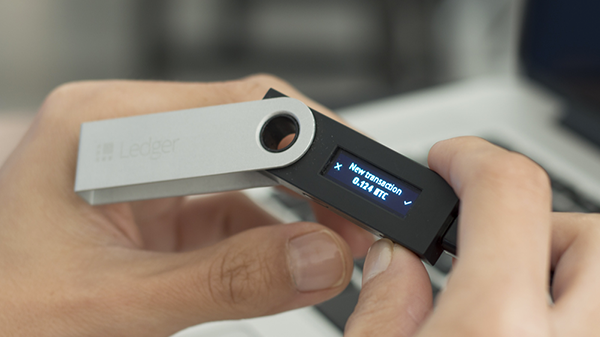 The hard wallets are pretty costly and Ledger Nano S cost about S$120 if you're ordering from the official Ledger Wallet website. 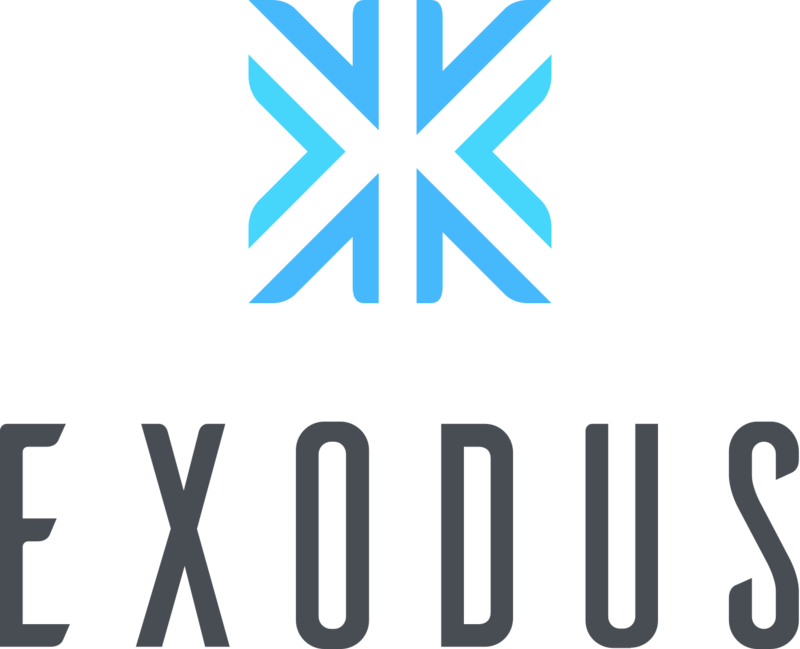 Currently, I'm hopping around several light wallets like Jaxx, Exodus etc. As I'm doing trades and the duration are relatively short, it is just like "hot money". These light wallets are not suitable if you're gonna put a big sum of money in for a prolonged period of time as your safety is not exactly compromised. But for hopping around and that being relatively small sum in the market. It should be fine. However, the safety is still a concern. I've came across plenty of cases whereby people are using light wallet to store their coins and ended up with nothing left and I'm actually feeling a little uneasy about it despite the fact that hot money is constantly flowing around when I'm doing trades. "Please remember to include the unique letters assigned to your account under “memo” or “instructions”"
Thank you very much for the input! Forgotten to include in earlier when I'm doing the guide. I've edited the post with the addition in! I am quite confused. It seems I will need a wallet and virtual currency intermediary. How do I trade SGD for Bitcoin? Similar to buying stocks on SGX. Let me try to relate them. For fiat ($) to crypto exchange, they're just like our brokerage houses (Maybank KE, DBS Vickers etc.) whereby you will use your dollars to buy into virtual currency. Coinbase/Coinhako are fiat exchanges in Singapore and uses SGD as the "buying-in" currency. However the fees are relatively higher compared to exchanges in the US. Personally, I'm using Gemini and they're a US Exchange. They're rates are at 0.25%. To use a US Exchange, I will first have to remit USD over to their account. This can be done by using DBS remit where currently, there is no fees charged for it. Next, wallet. Wallet will just be like our CDP, whereby they will hold the coins we own. Storing your coins on exchange is just like the "custodian service" of brokerage houses. One thing that is different is, storing on exchange exposes you to the risk of being hacked etc. Just a quick example, SCB is the custodian to the shares you've purchased using the platform. If SBC folds down, your shares will be going with them whereas if it is in your CDP account. The folding down of SCB will not be of an impact to you. One big difference is that SCB is much "safer", insured and well-known which provides you with the confidence to put your shares with them. But most exchanges are relatively new just as cryptocurrency is AND virtual currency are not insured. If it is loss, hacked or so. It will evaporate into thin air and nothing much can be done even if you know who stole your coins. Hope that clarifies your doubt! Thanks for the write up , very well documented. Am having below 2 doubts, your help would be appriciated. 1. Coinbase uses xrefs as an intermediate , any idea why or any details on this ? 2. Once u buy coins , how do i transfer from exchange to any hardware ? Is this like offline device ? Unfortunately I'm not a user of Coinbase. Nonetheless, I will try my best to answer the first question. 1. Coinbase is not a local company and they are situated in the US. For exchanges situated aboard, in order for funds to be deposited/withdrawn from the account an intermediary or telegraphic transfer is needed for the oversea bank transfer. For their case, they uses Xfers as an intermediary for bank transfer payment or "withdrawal/cash-out" instead of having TT transfer like Gemini. 2. Upon buying your coins from any exchange, proceed to the "withdrawal" tab or button and select on the respective coin you'd like to withdraw. For example, I have 1 ETH that is bought on Coinbase and I'd like to transfer it to my hardware wallet (ie. Ledger Nano) - I'd have to withdraw the ETH to my wallet's address. Hardware wallet are offline storage device specially made to store your coins. The safety of this "offline storage device" provides you with more security just like the wallet you have in your pocket. For the coins to go missing in the wallet, that would probably happen when you lose your wallet. There will be a unique address for you in your wallets. Locate the address and copy/paste it to your "ETH Withdrawal address" on your exchange. Likewise when you want to send your coins from your wallet to the exchange to sell. The steps for deposit is a reversal of the withdrawal for coins. Thanks soooo much for the detailed explanation very helfull information. Fiat to crypto , as ur aware its very long queue to get new account set up now. So other than Gemini and coinbase any others i can use with less fees. Stuck here , your help is appriciated. Reg hardware or software wallets - does it hv pre-defined number of coind ? And only limited to btc , eth etc. Or can we configure any four coins ? Indeed, for now as the crowd and fresh funds are rushing into the game, it is making the queue and waiting time relatively long. 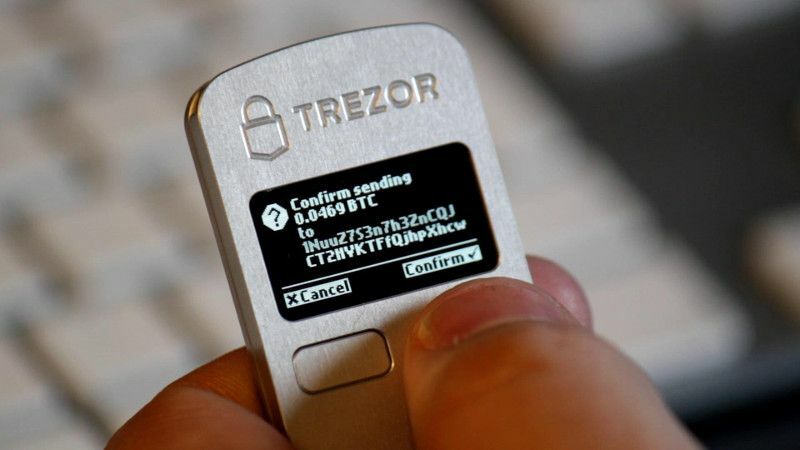 For hardware wallets like Trezor Ledger Nano, they provide a wide range wallets inside this USB like thunbdrive, of which you’ll be able to deposit an extensive amount of coins. Software wallet wise, those big ones like Jaxx etc the coins they provide storage for are fixed and there is no way of configuring it. Alteratively you might be able to find another wallet for coins that they do not include on the Github. Be reminded to do a check on the credibility of the wallet prior to depositting. Thanks for the reply and i did deposit using fybsg , hope ill get a reply soon. Hi SD, I'm a new reader and even newer at crypto! I know this is an old post, but I have a qst! Does Gemini accept USD via PayPal or does it have to be bank transfer? I did a search and some articles google pulled up seem to mention so, but on their website I find no such info. (Or maybe they've previously accepted but no longer do? Hmm..) I've funds there and seeing as how USD keeps dropping I'm better off spending them on US transactions than converting to SGD. Thank you! To my knowledge, Gemini only accept USD deposit via Bank/Wire transfer.